Astrid Cloverleaf: a knitting persona blog: wedding riiiings! 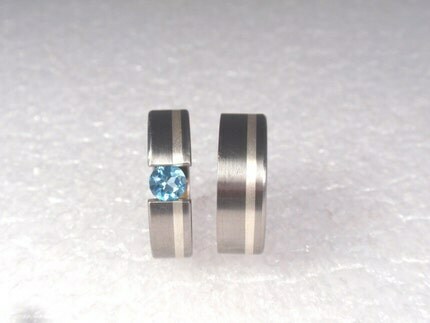 yeah... i'm pretty sure i just found our wedding bands. gotta show Steve tonight. the guy said that a set takes 1 week to make then ship and i can get any color stone i want. i'm thinking deep sapphire-blue color, or maybe green, or a yellowy-orange topaz... oh hell, i haven't the slightest clue! i know i don't want a diamond though, so that's a start.